SCOTT McNAMARA: Hi, this is Scott McNamara at the University of Northern Iowa, and I am an assistant professor in adapted physical education, and this is your Assistive Technology Update. JOSH ANDERSON: Hello and welcome to your Assistive Technology Update, a weekly dose of information that keeps you up-to-date on the latest developments in the field of technology designed to assist individuals with disabilities and special needs. I’m your host, Josh Anderson, with the INDATA Project at Easter Seals Crossroads in beautiful Indianapolis, Indiana. 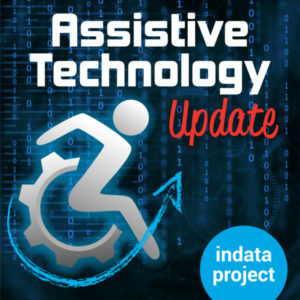 Welcome to episode 398 of Assistive Technology Update. It’s scheduled to be released on January 11, 2019. On today’s show, we are very excited to have Dr. Scott McNamara on to talk about adapted physical education. We’ve also got a really cool story about a new glove being developed to interpret sign language and also a story about the five finalists in the global mobility unlimited challenge. I came across a really interesting story today at Nairobi news. It’s titled, “Kenyan inventor invents smart handy gloves which turn sign language into audio speech.” the story talks about Roy Alaya, a 25-year-old Kenyan inventor who made a glove that actually can convert sign language movements into audio speech. It says that he made it because he needed to communicate with his six-year-old niece who was born deaf, and he was unable to talk to her, to really be able to understand what was that she was saying. A very cool invention. It does look like he’s already won some awards to work on a little bit. What a little bit different about this dance about the gloves that we’ve seen that folks are working on is this will connect to an app on the phone. So the speech generation is actually coming out of the phone. The sensors on the glove are interpreting the finger movement, the hand placement, and those kinds of things. Of course, with sign language is not just a full translation. It is interpreted by a interpreter. But still, if you think about something an individual could used to be able to communicate with folks when an interpreter isn’t there, and maybe there is no other way that they could just sign in the way they are used to and then have that audio feedback come to the individual who they were communicating with. So very cool. We will put a link in the show notes. I know we’ve had folks on the show, taking their brilliance and using that to make all these different creations to help folks with disabilities. Sticking with the check in the works and new innovations coming out, I found a story over at this.co.uk. It’s “Innovation: five futuristic assistive technology devices aiming to change the mobility world.” the story talks about the global mobility unlimited challenge. It talks about the five finalists, each of which won a $500,000 grant to compete in the finals. The winner of the finals in Tokyo in 2020 will win $1 million. The five devices that have made it so far are the EvoWalk, what is a smart wearable leg sleeve that will help people with partial lower limb paralysis to regain some of the mobility. Very cool cut different wearable device then we seen before. There is Moby, which they call the mobility equivalent of a cycle share scheme, essentially lightweight wheelchairs in city hubs, very well-traveled places and a ridesharing device that you can use. QOLO, Q-O-L-O, which is an exoskeleton on wheels. Essentially what it says is it is taking the chair out of the wheelchair. You can still be able to move around but while standing and hands-free. There is also QUIX, Q-U-I-X, which is another exoskeleton. It has actuators and different motors at the hips, knees, and ankles, allowing a person with lower limb mobility challenge is to be able to get up and walk around. Last but not least is the Phoenix AI Ultra-light Wheelchair. Think of a wheelchair but not quite as big and bulky, a lightweight Also it’s self balancing. It’s an intelligent wheelchair, so it gets rid of those painful vibrations for users. Very cool stuff out there in the works. It’ll be 2020 before we actually figure out who wins the challenge cup of very cool that these folks are working on all that new tech. We will put a link over in our show notes. Folks, we spent a lot of time on the show talking about universal design for learning and some of the assistive technology devices that make classroom more accessible for reading, math, and other subjects. But what about physical education? How do we adapt PE classes to better meet the needs of individuals with disabilities? Our guest today is Dr. Scott McNamara. Here’s going to talk about adapted physical education with the spirit welcome to the show, Scott. SCOTT McNAMARA: Hello. How are you? JOSH ANDERSON: I’m doing great. I guess my first question is something I know many of my listeners want to know. How in the world do I climb that rope and go back and have my elementary gym teacher not be mad at me? I’m just kidding. To start off, tell our listeners just a little bit about yourself. SCOTT McNAMARA: Okay. I’ll do my best. I do know myself better than anybody else. I’m originally from Detroit, Michigan. I taught a few years in special ed and an A.P.E. teacher there. I also did a sports camp for kids who were blind or visually impaired, so I had some experience with some Paralympic sports. The sport camp is called Camp-Abilities. and then I went to Dallas, Texas and got my PhD in adaptive physical education. Just last year, I finished at Texas Women’s University. I’ve had a great experience there so I was involved in a bunch of research. I teach A.P.E. classes — adaptive physical education is commonly called “A.P.E”. I also started a podcast myself about three or four years ago called what’s new in adaptive physical education where I interview people and do panels or one-on-one interviews with people in the field of A.P.E. and we will discuss a variety of topics on inclusion, behavior management, specific disabilities. I’ve got about 50 episodes right now. I’m in the podcast word with you. It’s always exciting to me other pod casters. JOSH ANDERSON: Yes it is. SCOTT McNAMARA: There’s not many of us. JOSH ANDERSON: No, there is not, especially in these kinds of fields that specialize in folks with disabilities. There just aren’t enough. SCOTT McNAMARA: No, there aren’t. JOSH ANDERSON: We’ll get more into the podcast later, but tell our listeners about adaptive physical education. A lot of folks don’t know about that. It’s something that, even myself, working in special ed, working in assistive technology, it’s something that I never thought about. SCOTT McNAMARA: I’m going to be biased for a moment. In my opinion — and I got my undergraduate in special education. I taught special education and A.P.E., so I have a unique outlook and expense about the whole education field for people that need special education. I think physical education is the most important academic area for people with disabilities. That’s a general statement, but I really feel that way. One of the reasons is that in physical education, you hit three different learning domains. You hit the cognitive domain, so understanding how to live a healthy, active life, understanding the roles of games and sports. You hit the affective domain, which is socializing with your peers, teamwork. And you also have those physiological things, which often get overlooked in a school setting, so the motor skills, sports skills, fitness skills to help people get out and be active to live the healthiest life that they can live, to communicate and live with others. To me, it’s a really important area. What it is, is it’s broadly defined within the individuals with disabilities education act as specially designed special education for students with disabilities. Basically what it is, is it a service. So usually you have an adaptive physical educator, someone who is trained, a physical educator who was trained to work with people with disabilities, giving them their services, adapting the equipment, adapting or modifying the curriculum, also mentoring and consulting with the teacher’s or extracurricular coaches. They should be specially trained. And then there is A.P.E. that can occur in a multitude of placement options as well. There is inclusive self-contained, partially inclusive — or integrated is the better term rather than inclusive. Different settings, but we are working in all kinds of things, especially designed physical education. That can mean a gamut of different things. JOSH ANDERSON: Is this implemented in many schools? SCOTT McNAMARA: That’s a big question. We have been part of the law — like we’ve been identified in the law since 1975. Sometimes in our field, I’ve heard people say that we are the best-kept secret in that law, because we are the only curriculum that — physical education is the only curriculum that is specifically identified within IDEA, even before it was reauthorized. That kind of makes us pretty special. Math, social studies, they are not identified, but physical education is. However, depending on where you are at in the nation, adaptive physical education can look a lot different. I’m in Iowa right now. There are a handful — maybe 20 to 30 real A.P.E. teachers here who are trained to be A.P.E. teachers per kids with disabilities are getting PE a lot of times, but they are not from trained professionals. Sometimes schools will call them A.P.E. specialists but they are not. But if you go somewhere like California, Minnesota, Maryland, they have a much better established A.P.E. programs. In California and Minnesota, you will find A.P.E. consultants or teachers in every school district, and you will find multiple once. They have a better design and much more known. Where you at? JOSH ANDERSON: I’m in Indiana. SCOTT McNAMARA: Indiana has a little bit as well. They do a better job of training their undergraduate PE teachers with A.P.E. stuff. Most PE teachers come out other college courses with one class that focused very generically on disability. As far as being a trainer and a A.P.E. teacher myself, I don’t think that’s enough. Sometimes those can be a broad special education class or a diversity class, rather than specific to physical education, which I also think is important. Physical education is very unique in how we work with people with disabilities. We need to be cognizant of some of the risk factors, but we also should not ever deny those services to kids. We have to think about how do we take in the physical aspect with all the other aspects of academia. JOSH ANDERSON: What are some of the adaptations that you guys use in your physical education program? I know there are probably hundreds but just give us an example of some of the different things. SCOTT McNAMARA: Sure. I’m sure you’ve covered that there is a lot of different technology, like low-tech, mid tech, high-tech. Such simple things like we use switches so we can work on speech and language things, where we will have a cause and effect where they have a big Mac — I don’t know if that terminology — those big things where they press that. You can have them do that and it might show a ball off. I’ve seen it were a football is in a sling, they hit their switch, football goes off. I’ve also seen sometimes people put blowers and all these ribbons, so once they hit the thing, the football goes off and these lawn blowers and confetti will come out. We are teaching that cause and effect. We have Velcro gloves where someone can better catch and handle balls. A lot of stuff with running for people with visual impairments. We have tethers, guide to ropes. A big thing is training people to work with people and/or not being a barrier. PE teachers and parents sometimes don’t want their kids to be physically active because they have this big fear of injury. Sometimes we need to train people as well on what we actually should worry about and what we shouldn’t worry about. We have weighted balls which are really cool. So like a soccer ball, there are some that have sandbags in them. A big issue is playing soccer at an early age, they get frustrated because they’re dribbling and they barely tapped the ball, and the ball goes 30 feet out. So the weighted balls allow it to stay right there with them. Are you familiar with Goalball? JOSH ANDERSON: I am, but tell our listeners about it. SCOTT McNAMARA: Goalball, we use that equipment some time for a lot of things. Basically Goalball is a Paralympic sport for people that are visually impaired. It’s basically a 3 to 4 pound ball, a hard plastic card that has bells in it. In the actual sport, it’s three on three game. The court is the size of a volleyball court. What you are trying to do is, everyone is blindfolded and they are in their own specific areas. Basically people are rolling the ball as fast as they can, and everyone is silent and that ball has those bells and it to hear it, and they are supposed to stop it before it goes past their goal line. The ball is in general, there are different types. There are trainer balls, the regular balls — we use those for audio tracking, sensory integration stuff all the time. There are other types of beeper balls. We have talking odometers, iPhones, that do all the things to track people’s steps. You can track heart rates. There are also sport specific wheelchairs that you can have. So there are different types for different sports. There are lots of apps out there. Am I spewing too much? JOSH ANDERSON: No, keep on going. SCOTT McNAMARA: I’ll highlight one that I worked with somebody on. You’re actually really excited. He has a program going on through ACSM, which is like the gold standard of exercise science. He’s working with this really a large organization, and he is doing an autism fitness professional certification through them. His program is called exercise connection. He trains fitness professionals through an online program how to get certified, how to work with people with autism specifically in a fitness center. That’s a growing world of fitness centers being better and more inclusive. He also has an app called exercise buddy which embeds all of the quote/unquote evidence-based practices. So visual modeling where they have kids with autism perform the actual skills. They have visual schedules with a bunch of PE activities in it. You can individualize it, you can put rewards in there. Very visually stimulating. That one is exercise buddy and it’s designed to do exercise PE for kids with autism, which I think is great. JOSH ANDERSON: Kind of a quick way through some of the stuff. SCOTT McNAMARA: I ran for seven minutes I think. JOSH ANDERSON: That’s fine. Some of that stuff, yeah, I’ve heard of some of the things, but some of it I had never even thought of. Switches, yeah many of us have used switches for somebody different things. But I really think about sometimes in training folks to use them comma to use a computer or tablet, it can get boring. There is nothing really great about it. If I can push a switch and it throws a football and confetti flies, that’s got to be easier to help train somebody those motor skills to be able to use those things. Like you said, the importance of PE to teach the cognitive skills and everything else. That’s a great example, just the motivation to learn stuff. I could see how that can add to it. JOSH ANDERSON: us a little bit about your podcasts. I know you mentioned it earlier but tell us a little bit more in depth about it. SCOTT McNAMARA: It’s called What’s New in Adaptive Physical Education. I started it because I was on iTunes and I was just getting in a podcast craze three or four years ago. I looked at my field and saw absolutely nothing. I looked up disability and saw very little. I looked up A.P.E. and saw a little. I was like, hey, I’ll try it. If you listen to my first few episodes, it’s definitely a work in progress at first. I don’t know if yours is similar. SCOTT McNAMARA: It’s definitely got more refined. I do interviews and panels. Like I said can we talk about a variety of topics. What’s really cool is that in my field, a lot of the — I’ve been told that my podcast has been seen as kind of a bridge from academia ivory tower to the practitioners. I like to have my panels be people from academia with research background and also practitioners. We will have a panel and talk about what is the best practice in academia, what is it like in the ground-floor. And we will debate some of those topics. It’s exciting stuff. I love it. I’ve got to meet all these great people, and I’m pretty young in my career. It’s been really cool for me to meet all these almost- celebrities in my field through the podcast. I love it. I have probably 50 episodes now. it’s being used in about a dozen college courses as part of their curriculum, which is cool. I got to be a keynote speaker about a month and a half ago at the national A.P.E. conference in California which was really cool and totally credited to my podcast point it’s been a great journey. I love it. I recorded the keynote speech on it, which is cool. I hope they are useful. I really enjoy it and I enjoy people contacting me about it. What’s your experience having a podcast? JOSH ANDERSON: You touched on some of it. I hope it’s of some use, but my favorite part is I get to meet some of these people in the field. So many of them have such great ideas. Not only that, but they take this intelligence, this great gift they are given and they use it for good. They use it to help other people. I think it’s amazing. For me, it also helps me stay grounded and modest because never am I ever the smartest person in the room. It humbles you, just to get to talk to folks and for them to take time out of their day — you included — to sit down and talk. It’s amazing and really need to. I used to have a problem in job where about three years and, I would get bored, just completely bored. My job itself is working one-on-one with folks and managing an apartment, so everything is always new. But this also helps to keep everything fresh and new all the time. SCOTT McNAMARA: I hear you. I feel really lucky to do it because I really don’t think what I did, as far as the actual work — is like I had an idea and I ran with it. Like you said, I get to sit across the table with people that are way more intelligent than I am and have such profound thoughts about specific things break I get to wrap my brain around it. It’s kind of the greatest accidental project I ever took on. JOSH ANDERSON: Isn’t that great? Isn’t that amazing how those things work out? We could spend the entire podcast talking about podcasting, but I have a few more things I want to ask you about. You have a certification that’s called a C.A.P.E., and I wanted to ask you about it; one, because it’s called a cape, which sounds like what superheroes wear. But tell me about what it is, why it’s important, and those kinds of things. SCOTT McNAMARA: The C.A.P.E. — and it’s usually called a “cape”. there is images of A.P.E. teachers like superheroes with the cape behind them. All it means is Certified Adaptive Physical Education teacher. I have a podcast that was recently done with the person who originally developed the endorsement. It’s a national endorsement and basically, it’s one of precursor to tell us you are qualified — it tells people that you are qualified to teach A.P.E. in a world where, sadly, a lot of our PE teachers aren’t certified. It’s a big indicator. Certain school districts are recommending it to different degrees appeared aligns with the adaptive physical education national standards, commonly called the APENS. you have to take the APENS exam to get the C.A.P.E. certification. Basically you need about 12 credits in A.P.E., a PE endorsement, some type of physical education and exercise science — I think special education bachelors degree. I’m not sure about special education. And then 200 hours working with people with disabilities to sit for the exam. Like I said, it’s basically a precursor to say you have some qualifications that set you apart from others to teach physical education to people with disabilities. There are a few states, about 13 states, which I think might change from when I last found that out. It’s hard to find out when states are changing their endorsements. But there are about 13 states that have A.P.E. endorsements that they require. But the APENS is kind of a larger national push to do that. They are revising the test and the national standard right now, and I work with them. I think it’s really important to have standards and really important to have an exam. I would push people does I have an hour and a half long podcast with the creator of it who is much better and more passionate about talking about why it’s so important. I really didn’t think it was that important. As a check on the list, right? And then I talked to him. I’m in tears about how much the standards matter. I could send you the link to that. JOSH ANDERSON: We will put a link to your podcast in the show notes so that folks can check it out and see what it’s all about and learn a little bit more. It’s hard to get into that, especially on the 27 minutes we have. SCOTT McNAMARA: I have 50 episodes on it. JOSH ANDERSON: Exactly. Really quick while we have time left, what do you think the future holds for adaptive physical education? SCOTT McNAMARA: That’s the ender? JOSH ANDERSON: Yeah, you have 15 seconds. I’m kidding. SCOTT McNAMARA: I don’t know. I ask that question as well to my panelists. I think about that. I think the field, I think in fitness centers and such, I think that there is a growing awareness and understanding and need for specially trained people to work with people with disabilities. I’ve seen that in the last five years, 10 years of the literature and such that that seems to be a growing area of. People want to be able to come out and enjoy recreational activities. The field of A.P.E. — which what I was talking about is more of an adaptive physical activity idea. That physical education is more about physical education in school. We are overlooked often, except in some areas and some states. My fear is that it’s been like that for a long time. I hope with the podcast is to inform people about it. I want it to grow because I think it’s incredibly important to. However, I’m always afraid that it’s going to be stagnant. At think we have some great professionals. I’m always excited when somebody gets on the news or a blog post about them because my field needs as much highlighting as possible. I don’t know what the future is. All I know is that I’m trying to do my part to make it as meaningful and bright as possible. It’s difficult when you go into many schools and there is no A.P.E. teacher and people haven’t heard of it. JOSH ANDERSON: It definitely is. It sounds like you are doing all the right things. Getting the word out there. Podcasting is a great medium to get the word out and find other individuals who may be have heard of and want more training, want to know more, or folks who have never heard of such a thing and then get to learn about it and get that into their head. Thank you so much for coming on the show today and talking about A.P.E. with us but we will put some links in the show notes for the podcast. Thank you so much for being on the show and I look forward to hearing your podcast. SCOTT McNAMARA: I appreciate it.